The Kiddo is my super A+, number one kitchen helper. This is the kid that once upon a time wanted to be the “Fireman’s Baker” – so he could live in the fire house with all the firemen and bake all their cookies for them. Yep, that’s my kiddo. 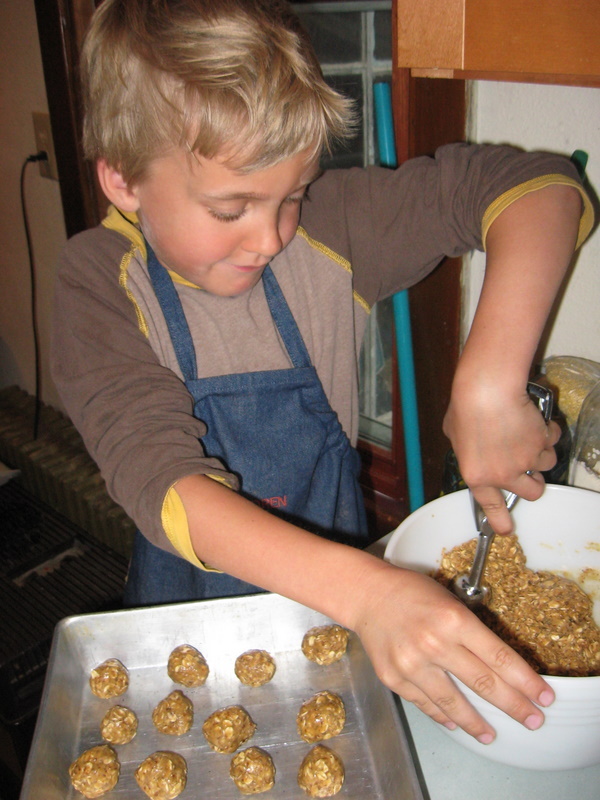 Of course, now that he’s older, I can’t always rely on him to help out in the kitchen. There are baskets to shoot, and bikes to ride, and books to read and, and, and. So, yah, I doubt Kiddo Creations is going to be a regular feature. But, when the mood strikes him, I’ll be all about the Kiddo in the kitchen. Sitting at the dinner table tonight, we were discussing this week’s Blogger Secret Ingredient, honey. The Kiddo thought my idea of the peanut butter balls was excellent, and helpfully pointed out that if I won, he’d be happy to eat any chocolate that has dairy in it, because you know, “Mom – you can’t eat it anyway.” Wise child. I pointed out that if he wanted a chance at the chocolate, he had to help with the cooking. Put honey and peanut butter in a microwave safe bowl and microwave for 1 minute. Stir together. Add oats and flax seed and stir until well combined. Add flour a tablespoon at a time until mixture is not too sticky to handle. Use a very small cookie scoop, scoop out mixture and roll into balls in your hand. This entry was posted in honey, oatmeal, peanut butter, snacks and tagged Kiddo Creations. Bookmark the permalink. The PB Powerballs sound perfect 😀 I love experimenting with GF flours but I’ve never tried sorghum! If you don’t have sorghum or can’t find it, I think just about any flour would work in this recipe. Millet would be good, or amaranth, or oat. I use a lot of sorghum flour because I found a local source (direct from the farmer) of it and stocked up. Yay for local sources! I could gobble these up! Yum!